I have never had an electric toothbrush. Now I know that they are awesome. Cybersonic 3 is everything I would want in a system and more. They have two sizes of brushing heads, compact and deluxe, tongue cleaning tool, sonic flossing, and teeth whitening. The toothbrush runs 45,000 strokes a minute. And the whitening is fast and gentle. Wow!!! Cybersonic makes a great product. Invented by a California dentist, Cybersonic is built on patented harmonic resonance technology to provide total care. As we get older, it becomes even more apparent how important our teeth are. Sometimes I wish I knew years and years ago what I know now. I would work so much harder making sure my teeth last a long, long time. Now I know that the toothbrush system can make all the difference. I would recommend this for everyone. The Cybersonic 3 is amazing. Another great feature is their free brushes for lifetime. Every three months, which is what they recommend for the changing time, they send you replacement brushes when you sign up. You only pay shipping. And as long as you are signed up, you get the lifetime warranty on the system. Join us in the Pitch List Holiday Gift Guide and be sure to enter the rafflecopter below. I received a Cybersonic 3 to review. All opinions and photos are my own. I have never thought myself an organic loving person. I was surprised at how good they can be. Newman’s Own Organic foods are in a class by themselves. They are flavorful and good to eat. I received a collection of their products to try for myself. I was skeptical but plunged right in. I am putting their chocolates at the top of my list of candies that I recommend and eat. I loved the raspberry, caramel and peanut butter cups. Yum!!! They weren’t what I considered organic should taste like. They were rich in flavor and satisfied my sweet tooth. My son loved the Ginger-O’s Cookies. He said that they tasted like gingerbread but with a little bite to them. He thought it was because the ingredients were natural. The Newman-O’s Creme Filled Chocolate Cookies were another favorite. They were crisp and tasty. I would have never associated them with what I considered “organic”. And the juicy dried fruits were amazing. I am changing my opinion on organic. I love products that have ingredients I have heard of. I will try more of Newman’s Own Organic products and recommend them to everyone I know. If you would like to try these, I am offering a giveaway with some of the chocolate products. Please enter below and try these products. You can find them in some local organic stores. I received products to review. All opinions and photos are my own. Gluten Free for Jen and Aquasana (sponsor) are excited to offer one lucky reader a chance to win this 3 Stage Under the Counter Filter System! First it goes through a 20 micro pre filter: this helps catch rust, sediment, and silt to help prevent clogging. The second filter is Activated Carbon: It will reduce organic chemicals, pharmaceuticals, herbicidesm pesticides, and MTBE among a few other things. Last but not least is the Sub Micron (.5) mechanical filter: this will reduce chlorine resistant cysts like cryptosporidium and giardia. It will also reduce mercury and lead and other heavy metals. You can read her complete review HERE. This Prize is valued at $249! The giveaway is open to US Residents only and will end on 9/3! Enter using the form below! I received product to try and review. All opinions are my own. Life with Norma Kay and the Pitch List are not responsible for delivery of prizes. 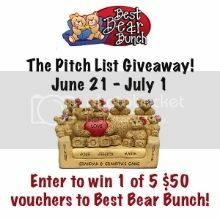 Best Bear Bunch is a company made to offer personalized gifts in a clearly fun way. Bears, bears and more bears. I love it. Finding nice gifts for family members has become a hard task. Best Bear Bunch has given me a way to branch out from the boring expected gifts to a fun and meaningful gift. I love them. I received my Bears on a Chair figurine to review. I got to personalize it. You get choices on your bears and accessories too making it a one of a kind keepsake. As you can tell from the pictures, I wanted to commemorate our living together and adding the dog Izzy was perfect. I received my own Bear on a Chair for review. All photos and opinions are my own.